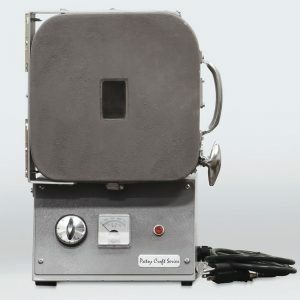 Enameling and Fusion Kiln with Window – Patsy Croft Digital Kiln Model #55F-TEW – Small kiln with digital set point controller and 2″ x 3″ quartz window. Enameling and Fusion Kiln with a window. With this Digital Set Point Controller, select your desired temperature with simple up and down arrows for an increase or decrease in temperature. 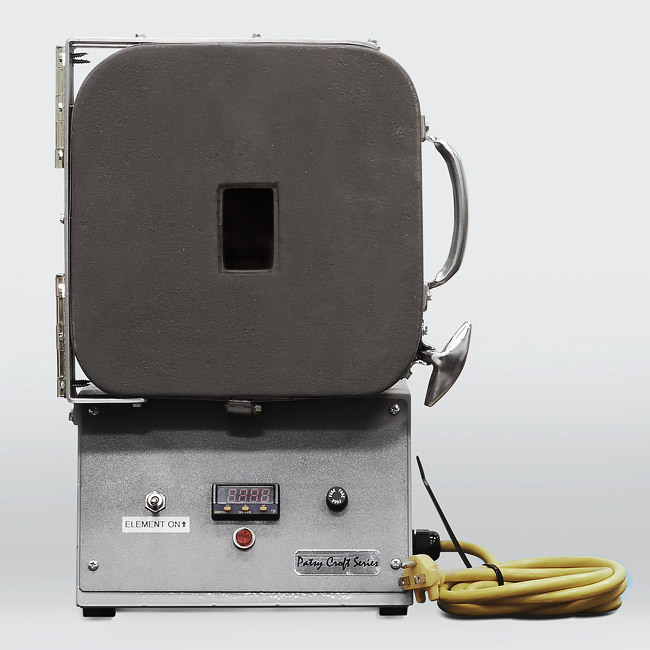 This digital jewelry kiln comes with a 2″ x 3″ Quartz Window. 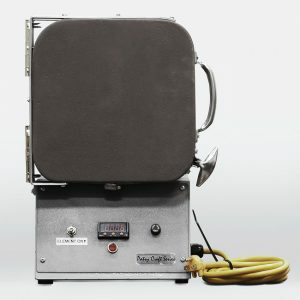 A small jewelry kiln with a maximum firing temperature of 2000 degrees and a window for viewing makes this kiln a perfect choice for the jeweler that enjoys metal fusion as well as enameling. Heavy-duty cabinet and element and real fire brick. Front-mounted instruments for easy viewing. Best kilns for home use. My kilns are handcrafted and designed for use in all mediums. 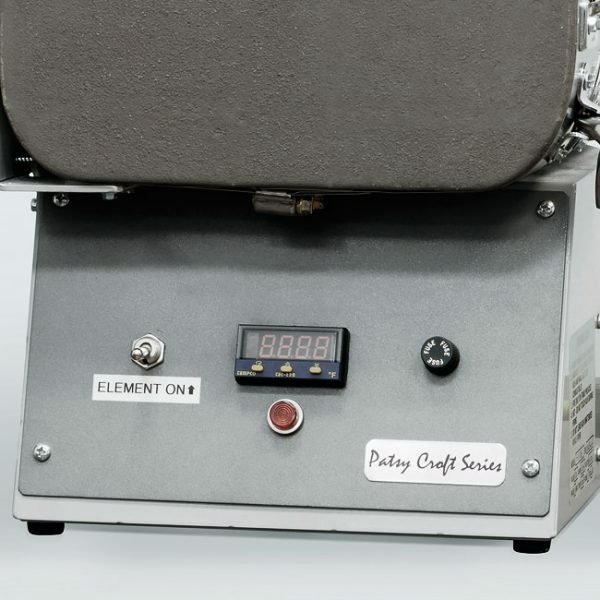 This kiln will help you create breathtaking jewelry or small keepsakes. This is the Jeweler’s Fusion kiln with a window . 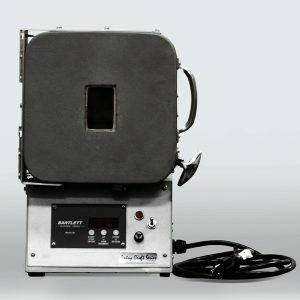 A digital fusing kiln with a window, this is the best and most affordable kiln for you. Yes and we all know why. We live in a digital world and a digital kiln controller takes less attention. Now you add the convenience of a window, and wow, now you have a Cadillac piece of enameling and jewelry making equipment. First, set the desired temperature you know your jewelry creation technique requires. Second, give it 10 minutes to reach temperature. Third, while it is heating you have plenty of time to prepare your artwork. And it takes you longer, this small kiln will reach your set temperature and hold it all day. Now, this leads us to another wonderful feature! Fusion of precious metals. If you are interested in fusing metals together you need a reliable kiln. Even though I grew into enameling and fusing precious metals, with no digital controller and no window with success, it is very nice now exactly where you are on the temperature hold point and be able to view the flash of fusion. Start creating with confidence! Order today the best enameling and jewelry kiln and the most important tool in your studio. 55F: Interior 5″ x 5′ x 5″, 77F: Interior 7" x 7" x 7", 88F: Interior 8" x 8" x 8", 99F: Interior 9" x 9" x 9"
What s sweet little kiln my #55F-TEW Croft kiln is! It is super fast, super nice having a door that I can shut without jarring my pieces, just a pleasure to use in every way. Get one even if you think you don't need it. You'll be happy. My other enameling kiln was like a 1999 Civic, got me to my destination eventually. The Croft kiln is like a Porsche, making it a pleasure getting there. I believe some of my recent cloisonne technical nightmares were possibly related to the abysmal slow recovery time of my other kiln once door was opened. With my new Croft kiln my temperatures hardly drop at all when I open the door, it's remarkable how well it maintains temperatures. I believe maintaining proper temperatures is important for proper fusion, especially once many layers of enamel are involved. It eliminates one of our many variables, always welcome in our enamel world fraught with kiln devils. The best enameling kiln I have ever owned. I am one of those people that love new kilns and now I own three. I bought the one with the window and controller. Works like a dream. Thanks for this kiln.